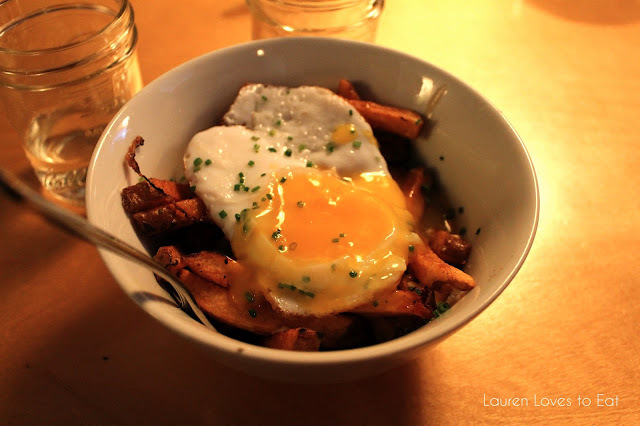 Duckfat was the first restaurant I put on the list for "must-visit" when I began planning our itinerary in Portland. It was highly recommended to us by co-workers and friends, and was a restaurant that kept coming up during my research. More laid back, and a little off of the main town area, Duckfat is a gem that can be easily missed. We walked right by the restaurant this first time and had to backtrack after double checking with google maps. The orange and white striped awning does not bear the name of the restaurant on it, so just make sure to check the exact address. The famously good Maine potato thick cut fries are the reason the restaurant first opened. A few years later, chef and co-owner Rob Evans was awarded Best Chef Northeast in 2009 by the James Beard Foundation. Now onto our visit. When we walked in at 3:30 on a Saturday afternoon, we were told the wait would be around half an hour. We were completely fine with this wait since we weren't exactly hungry after our big breakfast. Heading over to East Ender right next door, we ordered some beer and waited. There were 5 or 6 other people in the bar at the time, and we found out that they were also waiting for a table at Duckfat. There aren't many other shops, restaurants, or bars within a one or two block radius of Duckfat, so I assume that a lot of patrons usually end up hanging out at East Ender to kill time. 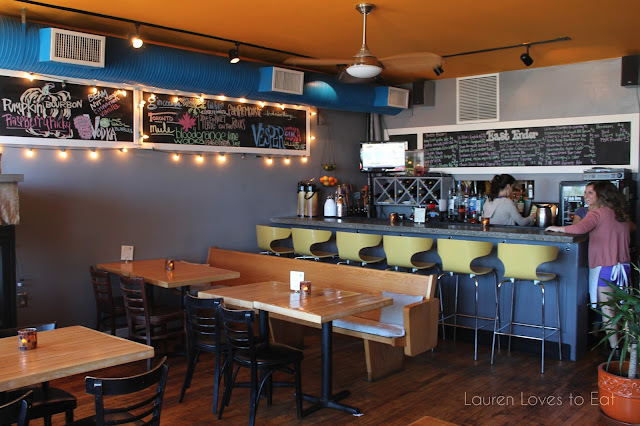 Unlike the inside of Duckfat, East Ender is very bright and airy. There are a few couches by the windows that are quite comfortable. 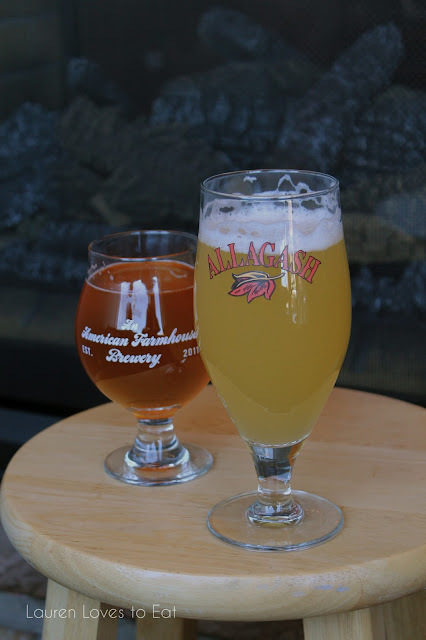 Allagash White (on right), $5: Wonderful Maine-brewed wheat beer. Unfortunately I didn't pace myself well, and when our buzzer suddenly went off 45 minutes later, I gulped down about half of this. It was still lovely. 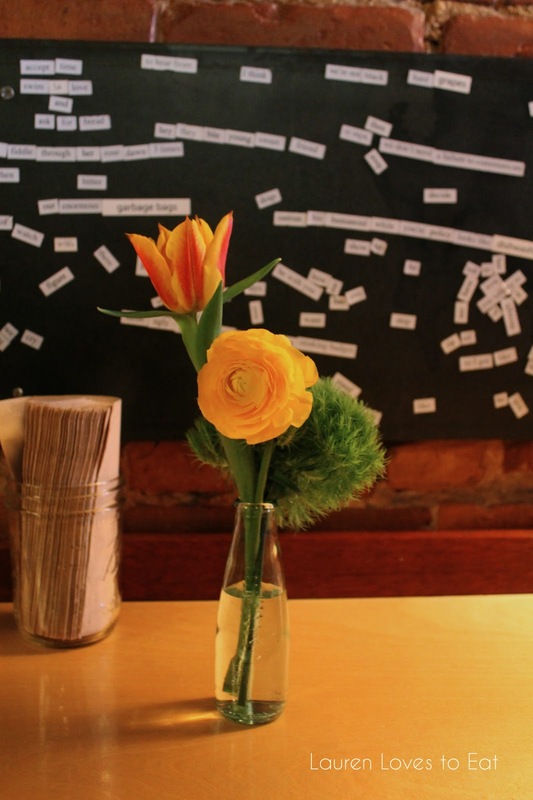 Seated along the right wall of the restaurant, we faced a board with individual word magnets. I didn't make any sentences because I didn't want to touch anything before eating (I'm just a tad OCD), but I did think that was a fun idea. Poutine, $6.50 (with farm fresh egg, + $2): The best, and I mean best snack/side dish I've experienced this year. I was excited to try this after reading all the reviews, but was still taken by surprise at how incredible this poutine was. Props to the bf for totally going against my wish of not adding an egg (fries with gravy and cheese sounds like a very complete dish already), and requesting the addition anyway. The Belgian fries are topped with house made duck gravy, Vermont cheddar, and fresh chives. With all the deliciously strong flavors, this dish managed to never taste too salty. 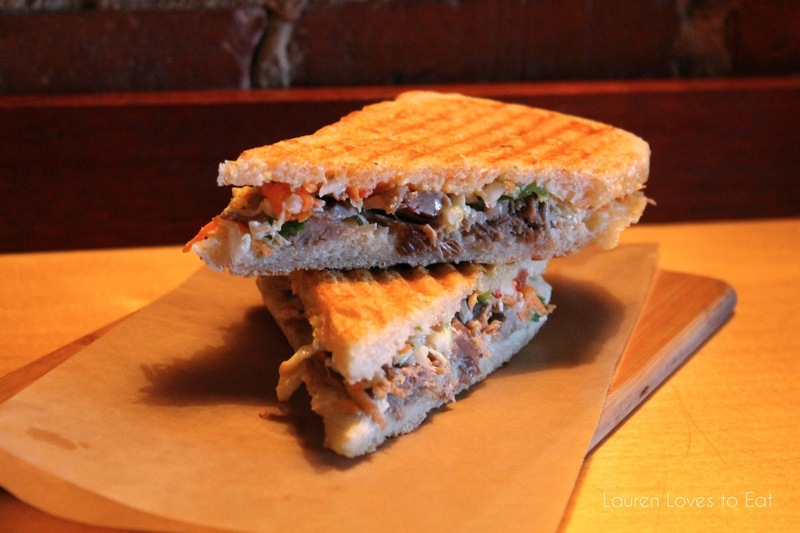 Duck Confit Panini with cabbage slaw, cilantro, and spicy mayo. $12: The duck was wonderfully tender, and paired well with the vegetable slaw. There was a lot of cilantro, but even that didn't distract me from enjoying the sandwich. The mayo wasn't very spicy, and I do wish that there was more of it, as some bites felt a bit dry. This was still excellent nonetheless. 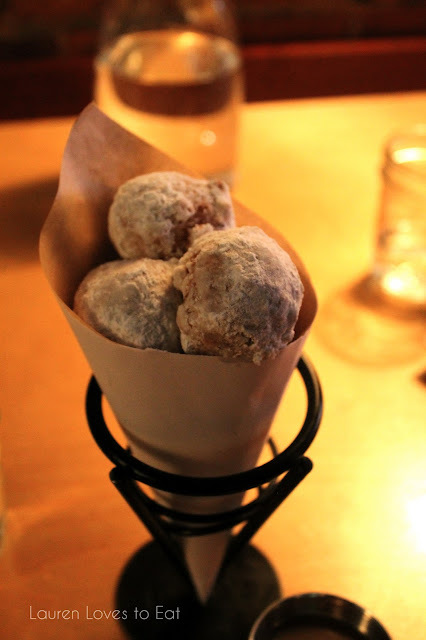 Powdered Sugar Doughnut Holes $4 (with a side of caramel + $.50): When we sat down, a couple next to us was just finishing up with these doughnuts. The doughnuts come dusted with either powdered sugar or cinnamon sugar. There are also side options (for an additional $.50) of spicy chocolate or duckfat caramel. There was a little too much sugar on these, but there's no denying that they are absolutely amazing. The doughnuts had the most perfect slightly dense texture, and were served so fresh and hot the sugar melted onto my fingers and I had to put it down between each bite. The caramel was slightly salty (in a good way), but I think if we were to order this again, we would get cinnamon sugar doughnuts and no dipping sauce. Trust me, they are seriously superb on their own. Next time I visit, I definitely want to try a milkshake. Flavors include duckfat caramel, burnt Maine honey, and chai and bourbon. YUM. omg, the fries with gravy looks divine. sucha great idea to add an egg on top. YUM! haha you have to check it out next time you're on the east coast!